During the 2015 and 2016 Fees Must Fall (FMF) protests, many student activists were charged with public violence and destruction of property. Even after Free Education became a government policy as of December 2016, those charges have still remained. Many of the activists have suspended sentences. Now the charged activists are on a mission to get those charges dropped through a presidential pardon. UPDATE: Justice Minister Michael Masutha addressed media on Monday morning regarding amnesty for Fees Must Fall activists. Masutha said they have proposed to students that they must constitute a delegation which will provide a list of affected students. He said the Ministry will help the students to approach the National Prosecuting Authority (NPA) and to get their cases reviewed. Masutha also said it should be noted Presidential Pardons are only granted to sentenced and convicted people. UPDATE: The state must give amnesty to all Fees Must Fall activists, Economic Freedom Fighters leader Julius Malema said on Thursday. On August 17, FMF activist Mcebo Dlamini walked from the University of Witwatersrand to the Union Buildings. His mission: to hand over a memorandum to President Cyril Ramaphosa calling on him to drop the charges against student activists. This came days after Bonginkosi Khanyile was convicted for public violence. Speaking to The Daily Vox, Dlamini said he has been made aware the the president is looking at the calls of a pardon and that he has appointed the justice minister and higher education minister to look at this matter through a committee. According to Dlamini, there are around 567 students who have been charged. â€œWell they have to drop the charges without any conditions. 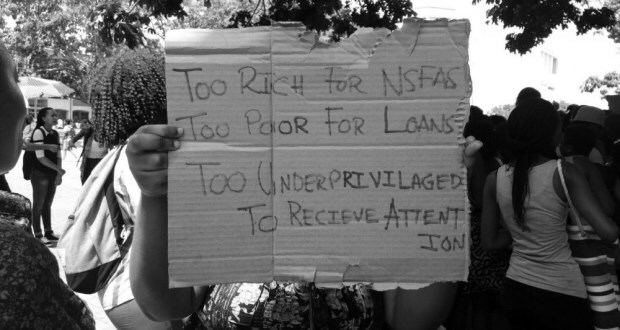 And then they can form some form of a TRC to look at the matters of Fees Must Fall,â€ said Dlamini about what he wants. Dlamini had been charged with public violence and damage to property during the protests. His court case has been postponed until September 3. Activist Bonginkosi Khanyile, who was arrested during the protests has vowed to carry out a sleepout outside the Union Buildings until Ramaphosa responded to his calls for a pardon. He is seeking a presidential pardon from Ramaphosa. Khanyile was convicted on charges of public violence and is due to sentenced in October. While studying at the Durban University of Technology (DUT) Khanyile was found guilty of aiming a slingshot at police during the protests. He was denied bail and had to serve five months in Durbanâ€™s Westville prison. Led by Dlamini and Vuyani Pambo, a group of student protesters from universities around Cape Town marched in Cape Town on August 22. They handed over a memorandum to the justice minister Michael Masutha, demanding amnesty for those who were criminally charged during the protests. In the group who marched in Cape Town were several students who had been granted amnesty by the University of Cape Town for their role in protests on their campus namely the #Shackville protests. During the Wednesday protest, students were firm that the calls for a pardon was not an admission of guilt. â€œWe as students use the word amnesty with reluctance because the word suggests that there was an offence for which one must be pardoned. We categorically believe that when we decided to protest it was for a just cause and the violence that ensued as a result was because of the provocation of the police,â€ said Khululwa Mthi, a student activist from UCT. Masutha received the memorandum of demands from students as it is his office which is tasked with applications for a presidential pardon. The minister said his office to willingly to help the students. The memorandum of demands includes the establishment of a nationwide truth and reconciliation commission to help universities, students and governments to understand the violence that took place during the protests. The South African Union of Students (SAUS) have also pledged their support for the calls for amnesty. Speaking to The Daily Vox, Thabo Shingange the Saus national spokesperson said they are saying students should not be prosecuted because any actions taken were towards achieving free higher education. Shingange said they will do anything and everything possible to bring this matter to an end and that the call is a moral one. â€œSo currently we have released a call for submissions. We are trying to gather this data. There is rough data out there but we canâ€™t really verify the validity of the claims. Itâ€™s believed to be around 547 students nationwide,â€ Shingange says theyâ€™ve called on student representative bodies and other student political formations to consolidate a list of names of students affected. He says once a pardon has been given to student activists, they want to engage with the higher education minister Naledi Pandor about the victimisation of students in various universities. In a statement released on August 21, the National Union of Mineworkers of South Africa (NUMSA) demanded the scrapping and unconditional release of all #FeesMustFall activists. Issued by Irvin Jim the general secretary, the statement calls for solidarity across all their members and comrades around the world to stand in solidarity with the #FeesMustFall activists who are being victimised by the state. During a keynote address at Stellenbosch University, the minister in the presidency for planning, monitoring and evaluation Dr Nkosazana Dlamini Zuma said that while she applauds the cause and what it has achieved, President Cyril Ramaphosa’s hands are tied when it comes to criminal charges against students.